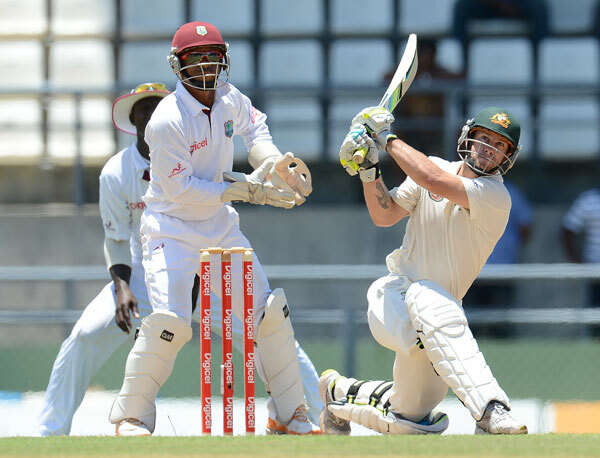 Wade, 24, was thrust behind the stumps for this series when 34-year-old Haddin stunned his side by announcing he was returning home for personal reasons and would not be available for selection. Wade, a promising Aussie Rules footballer in his teenage years when growing up in Tasmania, came in when Australia were tottering on 164-6 in their first innings on the first day on Monday. While he took time to move to his half century he went on the attack after that and scored his second fifty off just 33 balls, with the highlight being two successive sixes off the West Indies’ most potent bowler Shane Shillingford. He was eventually out for 106 as Australia were dismissed for 328 on Tuesday and by stumps on day two had the hosts in trouble on 165-8 giving them a lead of 163 and looking set to win the series in which they hold a 1-0 lead. Wade, who overcame testicular cancer aged 16, refused to get carried away about his innings being the one that sealed his place ahead of Haddin in the test side. “I don’t think it changes anything, my mindset definitely hasn’t changed,” said the Victoria number one. “There’s a lot of one day and T20 cricket in between, a lot of water under the bridge before the first Test against South Africa at the Gabba (in November), so I’ll do my job and see how it goes. down the road as regards his long term test career. He added that the tour had been a gradual learning process where he had had to adapt to vastly different conditions from those he had encountered before. “I don’t think I had any doubt I could play Test cricket, it’s been a massive tour for me, I’ve learned so much from the first game we played, the one dayers where the conditions were just so different from what I’m used to,” he said.